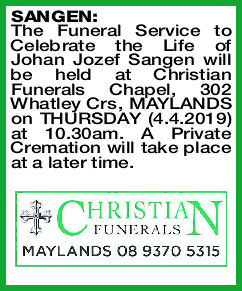 The Funeral Service to Celebrate the Life of Johan Jozef Sangen will be held at Christian Funerals Chapel, 302 Whatley Crs, MAYLANDS on THURS DAY (4.4.2019) at 10.30am. A Private Cremation will take place at a later time. 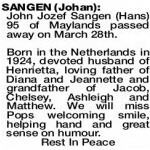 SANGEN JOHAN John Jozef Sangen (Hans) 95 of Maylands passed away on March 28th. 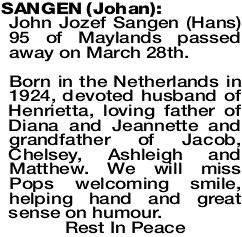 Born in the Netherlands in 1924, devoted husband of Henrietta, loving father of Diana and Jeannette and grandfather of Jacob, Chelsey, Ashleigh and Matthew. We will miss Pops welcoming smile, helping hand and great sense on humour.